As a winner of 11 GRAMMYs™ and a member of the Billboard™ Hall of Fame, Joan Sebastian is perhaps Mexico’s most famous and celebrated singer/songwriter with a career spanning 35 years and hundreds of songs. Joan draws strength and inspiration from a philosophy driven by three simple beliefs –Faith, Love and Luck. Now, Epiphone and Joan Sebastian unite to create the ultimate signature guitar that incorporates those three beliefs. Presenting the new Joan Sebastian signature Triunfadora (the Achiever) acoustic/electric guitar. This stunning companion to the Joan Sebastian Soñador might be one of the most beautiful signature guitars Epiphone has ever made. From the moment you first see the distinctive pearloid inlays featuring the Cross (Faith), the Heart (Love) and the Horseshoe (Luck), you know the new Joan Sebastian Triunfadora is clearly an inspired design. But once you pick up and play the Triunfadora, you'll quickly find that this a truly unique and beautiful instrument. Like all Epiphones, the Triunfadora is backed by Epiphone’s Limited Lifetime Warranty and Gibson 24/7/365 Customer Service. Check out new Joan Sebastian Triunfadora today at your Authorized Epiphone Dealer. 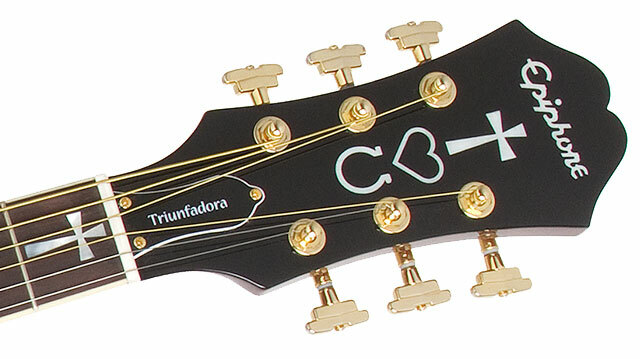 Headstock Sloped Dovewing featuring images of the Cross (Faith), the Heart (Love) and the Horseshoe (Luck) with Joan Sebastian signature on the back of the headstock in gold. The Triunfadora's body shape is inspired by Gibson’s famous J-185 but is slightly smaller than the super jumbo which makes the Triunfadora much more comfortable to play without sacrificing the guitar's great projection. The Triunfadora produces a big sound with clear acoustics and is equally impressive for powerful strumming or delicate fingerpicking and everything in between. And, the beautiful rounded cutaway not only gives the Triunfadora a distinctive look, but also allows you easy fret access up to the 20th fret. The rosewood bridge features a unique design reminiscent of the classic “King of the Cowboys” J-200 with pearloid "Horseshoe" inlays on the bass and treble side and a soundhole rosette featuring 13 pearloid "Hearts" inlaid into a ring of rosewood. Joan Sebastian chose this distinctive feature to pay tribute to the many loves he has found and lost in his life. The Triunfadora body is also bound by a stunningly beautiful hand inlayed Abalone. At the heart of every guitar is quality wood and with an acoustic guitar, nothing contributes more to an acoustic guitar's tone than a quality top. That’s why the new Triunfadora features a solid Sitka Spruce top with hand-scalloped, lightweight bracing that will only improve with age. A solid mahogany neck is hand-fitted to the Triunfadora's mahogany body using a traditional dovetail neck joint and Titebond™ glue which provides maximum surface contact and strength. The result of this combination is a guitar with deep, rich lows and shimmering highs and just the right amount of mid-range. Top it all off with an elegant solid rosewood bridge with pearloid “Horseshoe” inlays and the Triunfadora becomes truly a one-of-a-kind instrument. The Triunfadora features the Shadow eSonic™ preamp system with the revolutionary NanoFlex™ under-saddle pickup which gives you the control and sound quality you need when performing live. Designed in cooperation with Shadow of Germany, the eSonic™ is a small, lightweight preamp powered by two long-lasting lithium batteries. 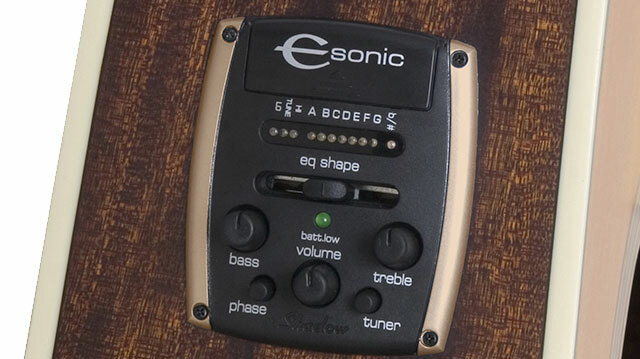 It features a fast and extremely accurate built-in chromatic tuner that allows you to "mute" the output of the guitar while tuning or while "unplugging" to avoid any loud "pop." Other controls include Master Volume, Treble and Bass EQ, a Dynamics slider that acts as an EQ frequency shifter, and a "phase" switch to help eliminate feedback. Under the saddle is Shadow's NanoFlex™ pickup. The NanoFlex™ design utilizes 7 highly sensitive and ultra-responsive layers of sensor material that not only sense the vibrations of the strings but the vibrations of the guitar body as well. This produces results equivalent to a condenser-microphone mixed with an under-saddle pickup with none of the harshness of a piezo. The NanoFlex™ is the first pickup to incorporate active amplification directly at the pickup. As a result, the signal does not pass through even a single millimeter of wire and therefore, the signal quality is uncompromised. Combined with its 100% shielding, the NanoFlex™ is absolutely and completely noise free. The new Triunfadora is not just a beautiful instrument. It's easy to play, too! The Triunfadora's mahogany neck features Epiphone’s famous SlimTaper™ D-profile which gives you great picking speed and playing comfort. 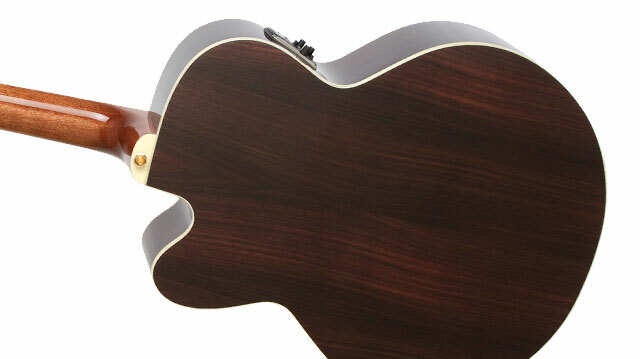 The 1.725” nut is slightly wider than your typical acoustic guitar. You'll find the wider string spacing makes it easy to finger notes more cleanly and is also great for fingerpicking. The Triunfadora also features a smooth, durable rosewood fingerboard fitted with 20 medium/jumbo frets with pearloid "Cross" inlays and Gold Grover® machine heads with stepped buttons and a 14:1 ratio for excellent tuning accuracy and stability. And finally, Joan’s signature is on the back of the headstock.